Following in the path of Hurricane Isabel the British Universities Sailing Association sent a team to America with the intention of kicking up a storm on the American college circuit. Over the last two months nine sailors from universities across Britain have been touring the east coast of America sailing against the aptly named American All Stars racing in four Trophy matches and the Inter-Collegiate Sailing Association series. Flying out to America, BUSA were current holders of the Trophy having convincingly won 4-0 on home waters under the captaincy of Mark Campbell-James. Responsibility to emulate such success was left to captain, Mark Lees of London University and team manager, Chris Guy. Upon landing the squad were straight into Larks at Bowdoin College in Maine. Fleet racing being the focus of American student sailing the BUSA team overcame the Ivy league colleges to win the last event on the US Team Racing Association circuit and set them in good stead for the first of their trophy matches; match racing in Colgate 26s. Arriving at the rescheduled destination of Maryland due to Hurricane Isabel, the team set sail in Chesapeake Bay. With shifty winds ranging from 5-15 knots and match racing in the unfamiliar boats anything could happen. Nevertheless the team of Andy Cornah, Andy Bryson and David Cheshire recovered from an early loss to win the next three matches securing the Lord King Trophy. Feeling more at home sailing FJs (similar to Fireflies) the next match allowed BUSA to call upon the best team racers the squad could offer, and so Mark Lees, Chris Martin, Andy Cornah, Sam Carter, Andy Bryson and Ian Martin took to the water to sail for the Lipton Cup. Yet BUSA had not anticipated the American rule insisting on swapping helmsmen and crews after each race and could not find a combination that would beat America, as they let two winning combinations slip through their fingers on the finishing line. This drew the series at 1-1 and after a gruelling nine-hour drive through the night the team were tired and worn, but spirits were raised when they met the infamous Ken Legler in Boston, known among UK team racers for his commentary at the Wilson Trophy. Organised was three-boat team racing in Solings, with spinnakers! In light and shifty wind only three races were planned but only two races were needed to beat the ‘All Stars’ giving BUSA a 2-1 lead going into the final match. Racing for the Performance Sailcraft Trophy was in Lasers so up stepped the ‘larger’ members of the team, Andy Cornah, Ali Hall and Andy Bryson. Despite their superior starting strategy, the team suffered a heavy pounding. With little practice in Lasers the team could not match the boat handling and speed of the Americans and lost a five race series 3-1. The BUSA team raced with a sister association that had marked differences in the set-up that can only be looked on with envy. 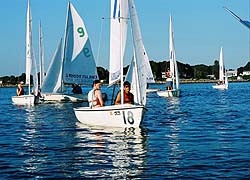 Every American college squeezes six sailing sessions in a week around study and all under the guidance of a full-time coach.